Whenever I go into a restaurant and I have to pay first then receive my food, I always have the assumption that the food is absolutely amazing. 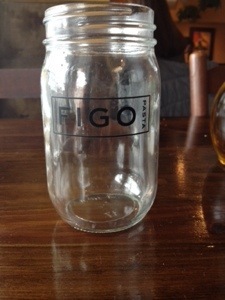 I mean if it wasn’t good and I had not paid first I still feel like I have some leverage on my side to at least exchange it or simply send it back, but when I pay first I feel like my leverage has somehow been stolen with a side of “your stuck like Chuck.” So “Figo” in Atlanta, Georgia you have ca hones for choosing this concept at your eatery. I have been feeling like pasta for several weeks now so “Lasagna di Figo” with egg pasta sheets, meat ragu, bechamel, mozzarella, and parmigiano reggiano cheese was on tap for the night. The pasta was light as a feather which was perfect, because no one ever wants to feel like they are eating pasta although they are eating pasta, but the ragu was sorta lost in translation, it was so smooth and so thin that my tongue never discovered the meat. The whole purpose of meat is to a provide a heartiness for the lasagna, also to provide texture, so with every bite you are keenly aware that your not just eating bread and sauce. Redemption is a concept I wholeheartedly believe in, redemption tends to make one forget the past, it almost provides a holy amnesia of sorts, and that is exactly what the cheese did for this dish. The lasagna was so cheesy, and when placed under the broiler it received a golden cheesy crust, that made me continue to place my fork in several times past the time I should. 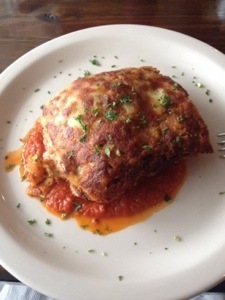 In between each bite the grudge I held against the ragu somehow softened, and my focus began to be on the positive bechamel that provided a richness and a depth of flavor, that is not typical for lasagna. 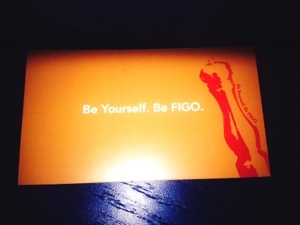 “Figo” your motto is “be yourself…” but yourself needs to be a little more precise so your complete concept meets complete execution…and when it does you most certainly will be cooking with gas.